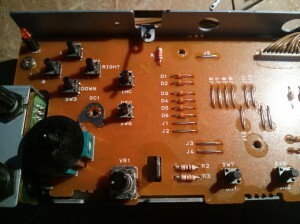 This week I started a project in which I want to replace the LCD screens in some of my synths. Most of them suffer from the well known decaying Electroluminescence (EL) backlight problem, resulting in a barely visible screen, and a annoying high-pitched sound from the transformer powering the backlight. I decided to start with the Wavestation A/D. It contains a 240×64 pixels dot matrix display with T6963 compatible controller. This type of display is used in A LOT of synths from that era. There are some equivalent LED-backlit displays available from various (Chinese) vendors. A lot of people replacing their displays use the white-on-blue version, which looks really awesome. After some searching I decided to go with a white on black display, available from ARTRONIC (http://www.artronic.eu/pl/p/LCD-AG-240064A-DIW-WKK-E6/1035). I find that it better matches the faceplates of most synths, (white on black), and it less bright in the studio without trading in readability. I used this guide (http://www.tellun.com/wavestation/wavestation.html) as a starting point. I did however want to cut as little cables and add additional components as possible. First I desoldered the flatcable PCB connector from the old Optrex display and re-soldered it to the new LED display. Using an external power supply i powered the backlight LED as a test. 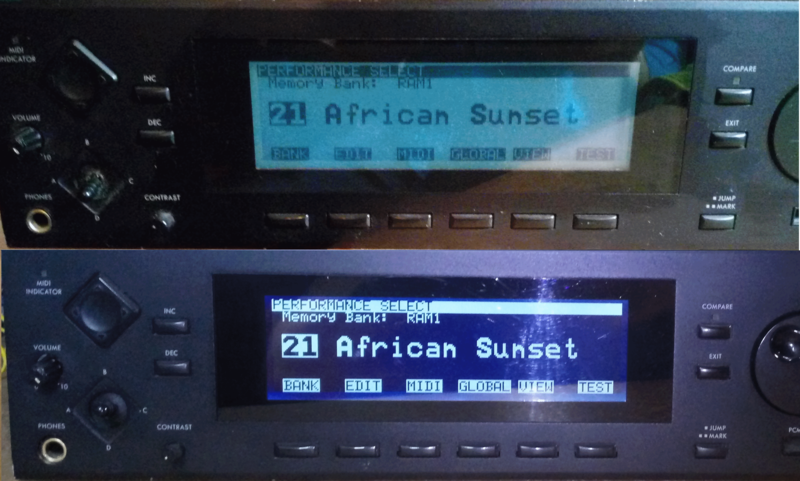 The pinouts of both displays were identical so I was pretty convinced the new display wouldn’t burn out. Powering the unit on I found the contrast signal range was way too high (as mentioned in the tellun.com guide), and the font size was off (also mentioned in the guide, suggesting Pin 19 / font selection should be actively pulled high). The latter I find strange as the original Optrex display also has font selection on Pin 19. The pin is open on the mainboard, maybe it is internally pulled high on the Optrex. I bridged pin 3 (+5V) and 19 on the display. Next issue is contrast. The tellun guide suggest adding an additional resistors as a voltage divider to lower the contrast control voltage range. Doing a little reverse-engineering on the contrast control of the Wavestation reveals it is build around a potentiometer and two resistors (VR1, R2 and R3), a sort of voltage divider fed by -12V. 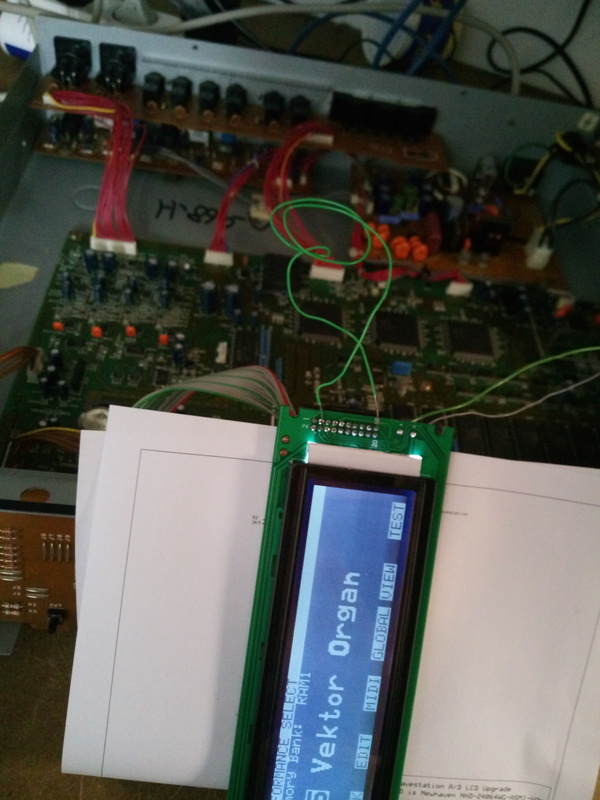 Sort of, because there is no connection to ground, making it just a variable resistor in the range of 0,7k to 2k5 between the LCD contrast pin and the -12V rail. I found that (while adding additional resistors in series) a resistance of 3.6kOhm gives ideal contrast. 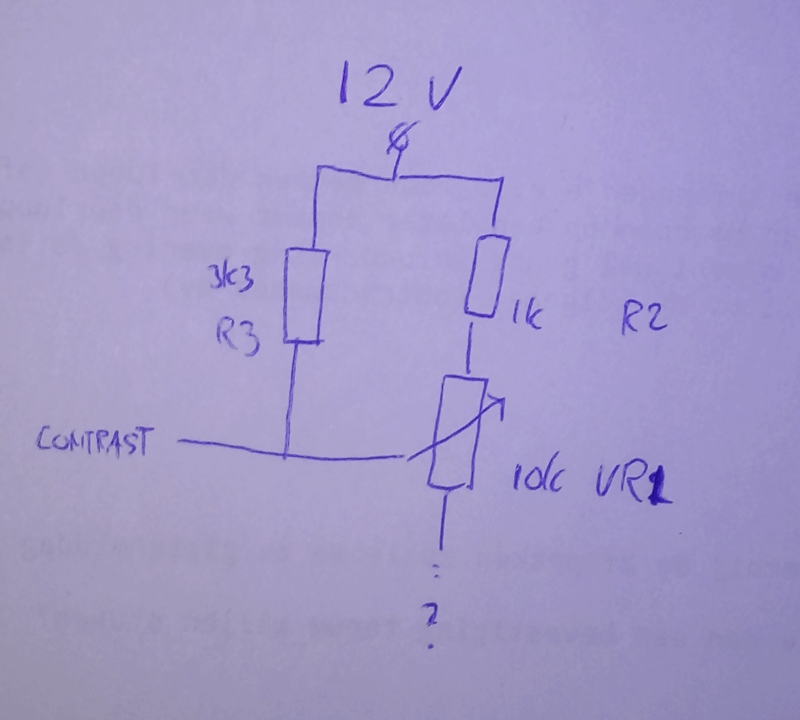 So ideally the contrast control circuit should work in the range of 2k5 and 4k5. I determined (using some obscure math) values of 6k8 and 3k9 for resp the resistors R2 and R3 give me approximately this range. While most of the electronics on the mainboard are surface mount, the contrast control is located on the front-panel PCB which is fully through-hole. So, replacing the resistors is an easy job and voids the need of cutting a wire or adding resistors to the display. All whats left to do is remove the transformer feeding the EL backlight on the old Optrex display, to eliminate the high pitched noise. I reused the wires from the EL feed to power the LED backlight from the mainboard, adding a 100 Ohm resistor from the +5V rail, as described in tellun’s guide. 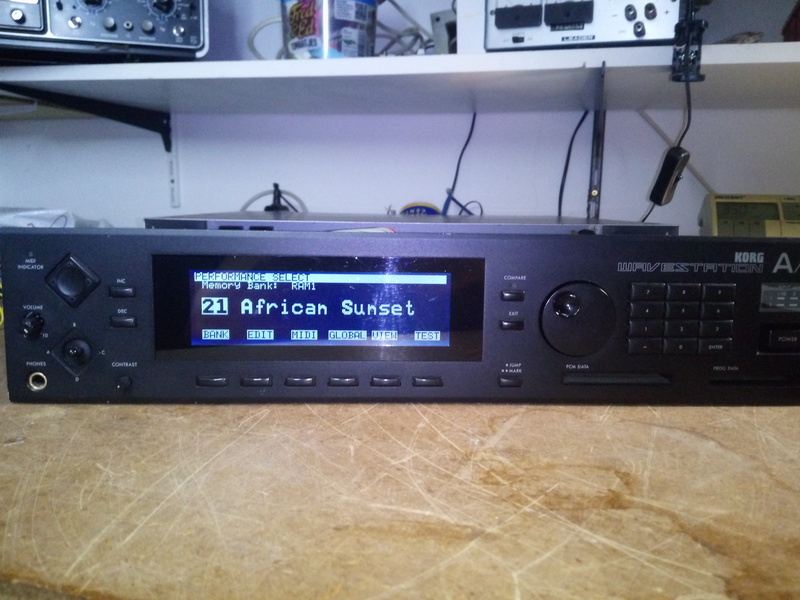 I have a Kurzweil K2000R, Kawai K5, Korg 01/W, Yamaha TG/77 and a Roland D70 which all have the same type of (failing) 240×64 display, wating for a overhaul 🙂 The D70 is in the worst shape with the annoying whine audible in the output signal.. so I´ll think this one will be next in line. Also I have an alpha Juno-2 with an 1×16 charachter LCD displayfor which I found a really nice OLED replacement 🙂 Stay tuned for the report on these! Did you ever get around to the K%? I was wondering if it used the same controller as the Wavestation. Hi, thanks for a great guide on how to replace the WS screen, and the excellent solution for the contrast problem. Your method means that there is just the one link for the font pin to be done on the actual LCD unit. I am preparing to do the surgery on my WS KB and wanted to ask what wattage resistors should be used for the 100 ohm LED backlight power and the two resistors on the control panel PCB for contrast? Thank you for the great write up! 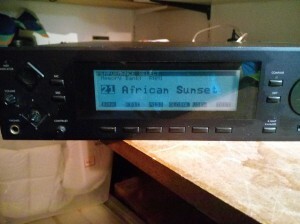 I just upgraded my Wavestation/AD LCD to ERM24064DNS-1 (http://www.buydisplay.com/default/5-2-inch-graphic-lcd-240×64-module-display-t6963-white-on-black). Suggested R2/R3 values did not work, however removing R3 and replacing R2 with 10K did the trick, LCD contrast knob has pretty nice range. I’ve spent the last few weeks fixing a zillion little issues, and some not-so-little issues, with my synths. It’s suddenly consuming me, so seems a little like a New Years resolution I never actually made, but it feels really good to cross some of these things off my list. Btw the artronic link you provided doesn’t want to work for me. Are they still around? Maybe the site’s just down? Hello! Thanks for your great resources on your synths – especially the details of this replacement/upgrade. Do you happen to have any information or images about the Wavestation’s cursor button? Mine came without the button, which I have now sourced, but I don’t have any retainer to have it fit tightly to the front panel. I see residue around the opening, so I think I may need to make something to keep it held more firmly in place. It works fine, but has a loose feel to it. I need to order a volume knob and the replacement LED screen, but it’s almost all back to 100% again now. I would like the cursor button to have the fit and feel of the original. Thanks! 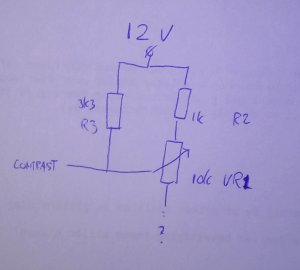 Sort of mostly followed this vs the tellun process, but couldn’t figure how you were getting the R2 & R3 changes to yield a proper contrast voltage (~7.5V) at pin 4. By not turning the contrast circuit into a proper voltage divider, I was still getting 11.24-11.86 volts with these replacements. I left your R2 & R3 values in, but then also put a 4k3 resistor (after trying a couple higher values yielding too much washout for my taste) on the back of the PCB from the R2 leg closer to the contrast pot to ground and got a working voltage. That adds the ground to create a voltage divider and yields voltages that go up to, I believe, 8 and down to 6.2? It worked – it was late. The contrast knob impact doesn’t seem fantastic, but the new display is contrasty enough throughout the range that it works a treat. I didn’t even realize that my favorite thing was going to be response time vs just having a working display. No more LCD lag between changes. Note to anyone thinking an IDC box header would be a good idea on the new display. Nope. There’s not nearly enough clearance when you mount the panel. I wasn’t even finding a cable header like Korg used. So, good luck with desoldering the header from the old display, but you may be best off going through the process of direct soldering to the new panel with your ribbon cable. It’s just tight behind the display no matter what. I’ve used the same led display for my wavestation and find it extremely dark and difficult to read. The datasheet of the led display shows that there is already 5V supply on the ribbon connector pin3 and from there via a 1K resistor to pin 10. Does this mean that no further 5V supply is needed for the anode and cathode? 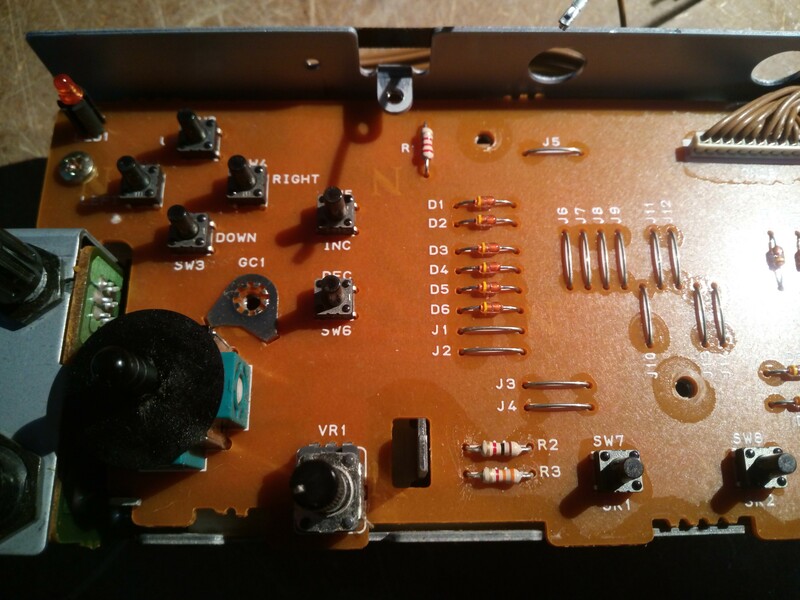 Hi, just add that for model EX, the resistors to tweak are R17 & R18 according to Wavestation schematics, on the DAC board 1416-KLM, very close to the VR2 (contrast control knob). Pin headers 2.54mm tourned fits perfect on the PCB holes for those resistors, and makes easier to find the perfect combination of resistances that may need a certain LCD model. Congrats for nice information, that made tellun’s guide improvement, just remember NOT to cut wire 4, that was my mistake and makes a contrast knob disconnection to LED board!.